As the name suggests, it's all about the sushi at this Scrutton Street spot, between Shoreditch and the City. But the surprise? Well, that comes from inventive toppings for the fish - think seared salmon with mixed radish and beetroot, or sun-dried tomato and melted parmesan. Elsewhere, it's pretty much classic sushi, sashimi, nigiri and maki. 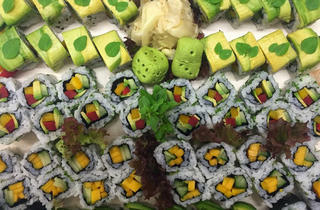 Expect, therefore, slices of salmon, tuna, scallop, prawn and eel, California rolls, sushi boxes and platters for sharing. There's also donburi, sushi salads and 'new style' sashimi - thinly sliced fish gently cooked with warmed olive oil. The drinks list features soft drinks, hot Japanese teas, miso soup and organic coffee. Keep an eye out for lunch set menus too - they come with a complimentary little gift from the chef. How nice. We are totally mad! We will go bankrupt! High-end sushi at take away price ! ?$&@ !! Best sushi in the city. Nice crew, delicious food. Great sushi! I love this place. Best sushi in town! Always fresh and tasty! The shops atmosphere is great and the staffs are skilled and helpful! You're in for a treat there for sure! seared salmon, rainbow rolls..all my favs. great music, friendly staff. They served me with a big smile even 5 minutes before closing and gave me the last portion of miso soup for free. Wonderful sushi in a great atmosphere with trendy music. yummy sushi, nice, friendly chef excellent, veggie options (with mango and other stuff). Lots of kind of drinks, fresh salads. Must go there on the weekend! The music is very cool, nice deep house, cool rhythm. Who is the dj there? :D Great sense of music. pleasant to be there. I wish I could download the tracklist. Hidden gem, it was invented for me who likes high quality but not crowd . really nice, fresh sushi and I loved the surprise from the chef. Boys are very friendly and I adored the donburi and new styles sushi boxes. MUST TRY!!! 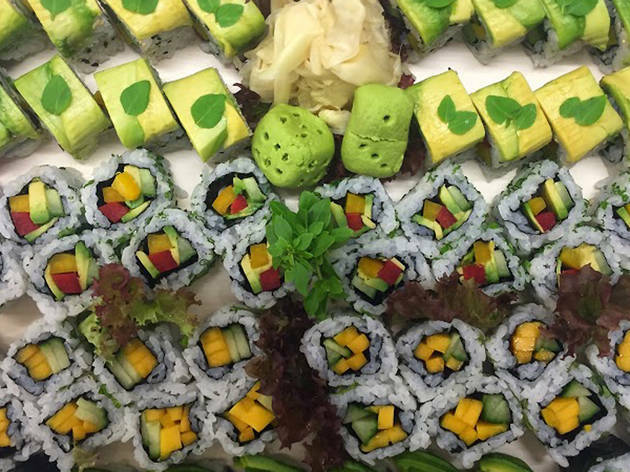 Great quality, creative sushi where you least expect it! I had a variety of different mouthfuls, all put together in front of me and explained by the chef who really knows his stuff. It's not much to look at - when you walk past the door you could be forgiven for having second thoughts, if you notice it at all - but have faith and you will be rewarded with a true sushi surprise! Awesome find in the sprawl of Shoreditch. It is a quick walk from Broadgate as well, which means it's easily accessible for the City folk as well and not just hipsters. A had the salmon sushi selection, which was 8 salmon avocado pieces plus 3 salmon nigiri. For £4.90! What a steal! And do not fret about price reflecting on the quality- the taste was fresh and absolutely superb. If you add £1 you get a cup of miso soup. I also opted for the surprise (omakase) and was a piece of salmon nigiri brushed with bbq sauce and the blow torched. NOM. Seating inside is limited but recommend getting takeaway else they charge you the 20% VAT. Their sushi chef is not just a Chef, is an Artist!